A couple of years later, I moved to the Twin Cities area, although admittedly on the eastern fringe in Cheeseland. I remained a member of Chapter 790 (as I still do today), but realized I needed to establish a local relationship with EAA folks. I remembered the guy I had met from Minneapolis, one Dan Carroll, and got his email address. His response allowed as how Chapter 25 might be interested in having a new member. Actually, his return email with directions to the next meeting arrived nanoseconds after my inquiry. I took this as a good sign. I attended my first Chapter 25 meeting one snowy February night at the ANG auditorium -remember those pre 9/11 days? The subject was Artic Operations of C130s, and I thought “Welcome to the Northland”. Frank Hanish was President, and he greeted me warmly on that February night. Then I remember going to a meeting at Washburn High School, hosted by an escapee from Down Under. Guys had plans for a variety of homebuilt aircraft laid out on desks. Everyone mingled with coffee and cookies while talking airplanes. Frank was there again, relaxed and friendly. I met Noel Allard, and we talked about our far flung residences – his in Chaska, mine in Wisconsin. I further appreciated this conversation since I had already had the chance to enjoy reading his book on Minnesota aviation history. I began to realize something amazing – I had found another exceptional group of aviation enthusiasts. Shortly thereafter I got my first airplane and decided to begin flying Young Eagles. Something not so strange happened again. 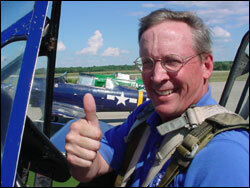 I found a bunch of people in the Chapter who were excited about exposing kids to aviation – either by flying them or teaching them — Guys like Mike Dolan, who was Young Eagles Chairman for over ten years. Now I know that countless EAA members can relate almost identical experiences, and will in the future. In fact, I think that people who love aviation are frequently this way – even air traffic controllers more often than not. Now there was that guy at Jacksonville Center, but that’s another story. If you go to almost any airport, you will run into someone who will sit down and talk airplanes with you. The rest is easy. And I found a group of people – Chapter 25 – who made it easy for me. Having been involved in chapter operations for a while, I decided I was ready to be the guy where the buck stops, so here I am. I can tell you I am excited, and also a little bit scared to be Chapter President. I can tell you I’ve got some ideas, and some of those involve asking Chapter members to do things. I am not worried, however, because I know this Chapter has a bunch of enthusiasts. Also, fright gives you a helpful edge to accomplish things. All I really ask is of you is that you continue to make it easy for new people to call Chapter 25 home. We are also on the verge of a special year, as 2006 marks the 50th anniversary of Chapter 25′s founding. Over the next year I want us to spend some time reflecting on the history – hearing about it and talking about it. One of my projects is to get a handle on those people who followed Bert Sisler as our first President. These guys and their fellow officers laid the foundation for what our Chapter is today. Many of them are also still members like Bert. I also want to thank the other officers and directors for their help in advance. We owe a special thanks to Pat Halligan for keeping a vast number of plates spinning over the last three years – he kept them all up in the air, just like the circus act. And with a smile on his face and extreme confidence. We are in good shape as we go forward. To kick off 2006, one of our faithful Newsletter sponsors, Dr. Phil Sidell, has agreed to speak to us about the ins and outs of acquiring and keeping your FAA Medical. Whether you are a pilot or not, I’m sure you will enjoy hearing Dr Sidell, who will separate fact from myth on this important subject. Franco Fiorillo from Airlake will also be introducing us to a new Light Sport aircraft called the Flight Design CT. Please join us at Washburn High School on January 18th. And those of you who are building airplanes, please attend so you can give a short update on your progress and problems. See you there!